If I had known that it was also called the Sultana Bird, I think I would have been even more determined to see it! 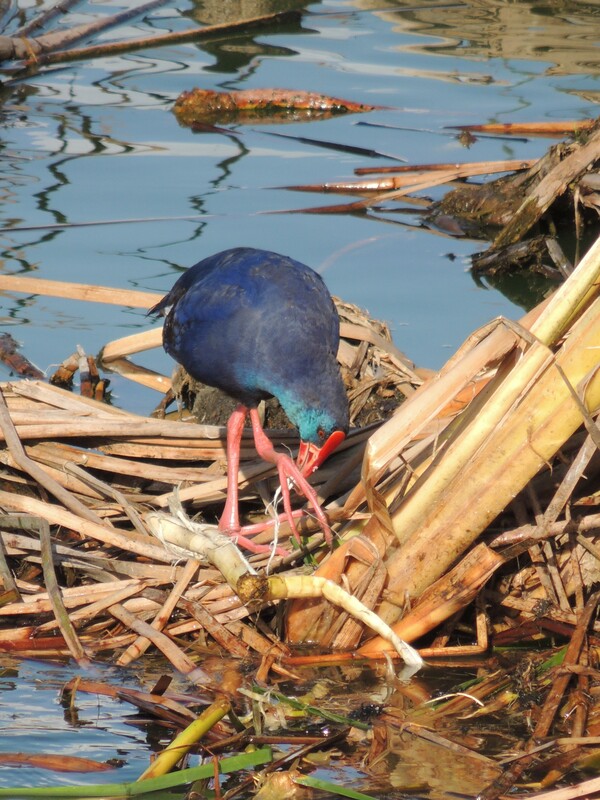 The Purple Swamphen is known as the Sultana Bird because of its French name – talève sultane, its Portuguese name is Caimão-comum. It was one of the birds I was keen to observe when we first decided on a birdwatching trip to the Algarve. We didn’t get to see it on our first visit but we have been lucky enough to observe them on subsequent visits from the main hide on the Ludo and Lagoa de São Lourenço walk. The diet of this chicken-size bird consists predominantly of plant matter including shoots, leaves, roots, stems, and flowers, and on the days we saw them they were thoroughly enjoying the roots of the reeds. They use their long toes to lift the roots to their bill. 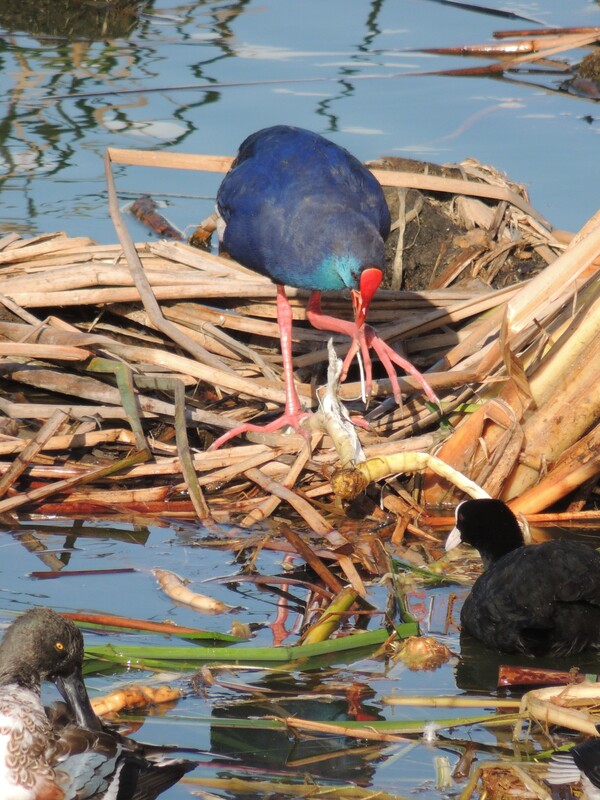 In preparing this post I did a little bit of research, and came across a couple of articles which said the Swamphen always uses their right foot to eat from. I didn’t know this fact at the time of observing them, and so I had to look at my photographs to see if this was true. The first couple of photographs I looked at suggested it was. However as I delved deeper into my photo album I came across quite a few others where it look as though the left foot was being used. So either I had found Swamphens who were unusual in being ambidextrous or this fact is a myth! In some light the purple-blue feathers look almost silky, and its bright red bill, mandible and eyes make it unforgettable. I was so excited when we first saw it! It is a beautiful bird and watching it find and eat the roots was memorising. The Romans also thought it was a beautiful bird as there is evidence they kept them as decorative birds on the grand estates. If you have not yet seen one and are in the East Algarve then I certainly recommend spending a while in the hide at Ludo and Lagoa de São Lourenço. To find out more on this hide and others download the excellent Algarve Birdwatching Guide. Copies are also available from most Tourist Information offices in the Algarve. As well as the Purple Swamphen I had a few other wildlife must sees on our first trip to the Algarve – Flamingoes, the Chameleon and the Portuguese Water Dog. You may recall from my Flamingoes post last year I have been lucky enough to see them on every visit, and since that first trip of only spotting one we have seen flocks upon flocks. I never get bored of them, so expect another post one day! Unfortunately the Chameleon eludes us despite a search earlier this year. The Portuguese Water Dog also remains on the list, but hopefully one day we will see one. For now though I just have to be content with pictures of Bo and Sunny, the Obama’s Water Dogs!